Mikey Wright has advanced out of the elimination round at the Tahiti Pro. BROTHERS Owen and Mikey Wright could both find themselves in the top 10 in surfing's world championship title race by the end of the Tahiti Pro if they continue to perform well in tricky conditions at Teahupo'o. After world No.2 Julian Wilson crashed out to a wildcard in round two, both Wrights successfully navigated the elimination round in small 1-1.5m waves to advance at the world tour event. Owen produced the second highest score of the day to beat French surfer Joan Dura while Mikey came from behind to down Brazilian Miguel Pupo. "It's a shame the forecast isn't really delivering for this year's event but we all have to deal with the same conditions," Owen said. "Even at this size, you can still find fun ones out at Teahupo'o. "It's great being here with my family and having my brother Mikey stay with us for the event. He's been on a tear this season." Owen Wright is in fine form in Tahiti. Mikey is currently ranked ninth on the world rankings despite being an injury replacement surfer this season and consequently missing an event where he was not required. Owen is just out of the top 10 in 11th place but a good result in Tahiti will move him up the rankings. 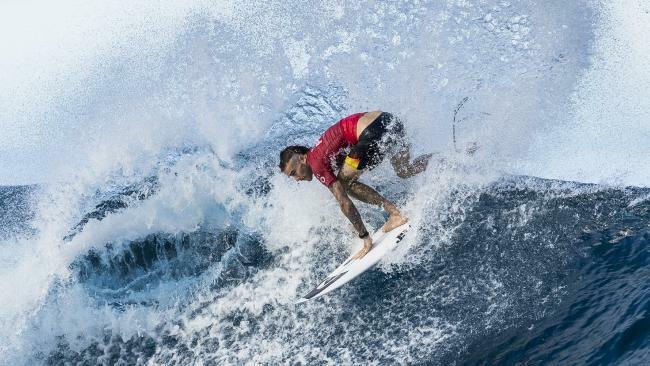 The only other Australian in the top 10 still in the competition in Tahiti is rookie Wade Carmichael in sixth. Carmichael was a round one winner and will now take on Brazilian Jesse Mendes in round three with Owen drawn against Joel Parkinson and Mikey against Brazilian Yago Dora.